What will save the bees? In an effort to explore the issue, National Geographic commissioned writer Charles C Mann and photographer Anand Varma to produce a story called Quest for a Superbee for the May 2015 issue of the magazine. A fascinating retrospective that delves deeper than everyday hysterics about the ‘beepocalypse’ unveils one of the biggest threats to our most important pollinator is the Varroa destructor, a mite that is quickly becoming resistant to the chemicals beekeepers are forced to pump into bee hives to protect them. In order to better understand his subject, Varma became a beekeeper himself. Read on to learn more about this fascinating video depicting the first 21 days of a bee’s life. In a TED talk, Varma describes the mechanics taking places throughout the video he produced with U.C. Davis, from egg to larvae to a fully-grown working machine. In it, he explains how the Varroa mite attacks the baby bees and weakens their immune system. He claims the mite is the single greatest threat to bees, greater even than neonicotinoids that have received so much press in recent years. In their quest to create a Superbee that can withstand all of the environmental obstacles humanity throws at them combined with nature’s own challenges, Monsanto is also getting involved. And you know what an uproar that is going to cause. It’s definitely worth heading over to National Geographic to read the whole story, which will give you a much better picture of what’s really happening to bees and what we can and can’t do to help them. 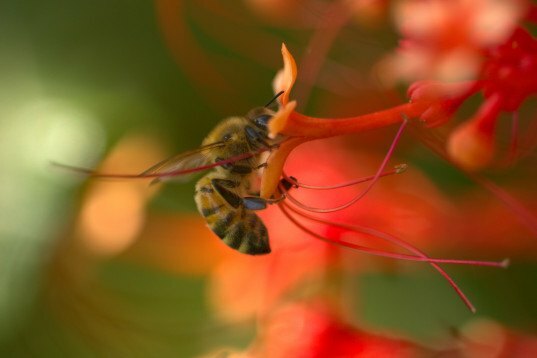 What will save the bees? In an effort to explore the issue, National Geographic commissioned writer Charles C Mann and photographer Anand Varma to produce a story called Quest for a Superbee for the May 2015 issue of the magazine. A fascinating retrospective that delves deeper than everyday hysterics about the 'beepocalypse' unveils one of the biggest threats to our most important pollinator is the Varroa destructor, a mite that is quickly becoming resistant to the chemicals beekeepers are forced to pump into bee hives to protect them. In order to better understand his subject, Varma became a beekeeper himself. Read on to learn more about this fascinating video depicting the first 21 days of a bee's life.